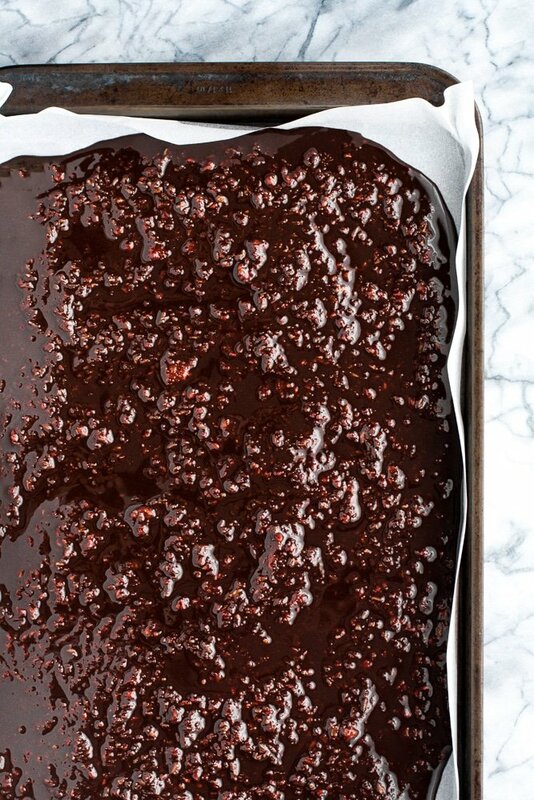 This dark chocolate raspberry bark is a perfect fat bomb dessert recipe to have on-hand for parties and get-togethers! 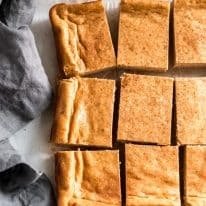 It’s delicious, easy to make, and is compliant with a variety of diets, such as keto, paleo, and vegan! It’s time to take your tastebuds for a whirl! 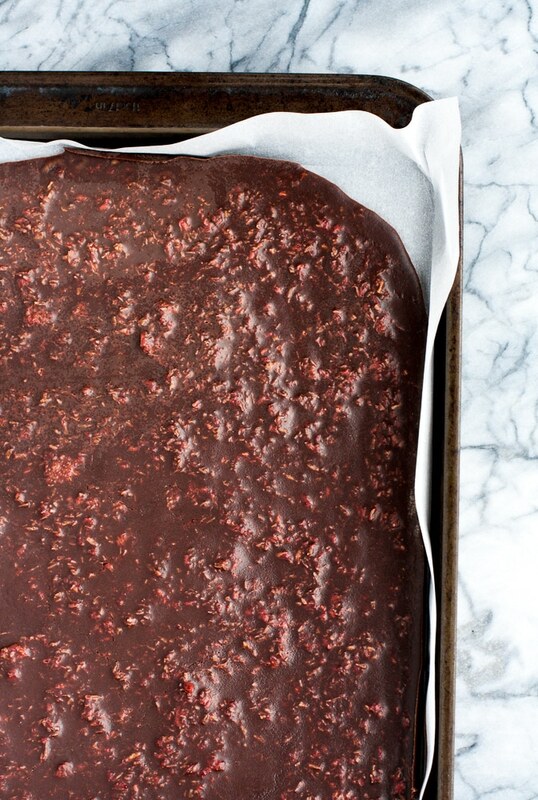 One of my FAVORITE recipes yet, this dark chocolate raspberry bark is NO joke! It’s absolutely delicious, easy to make, AND is compliant with over TEN different diet lifestyles. Perfect for keto, low-carb, paleo, primal, gluten-free, grain-free, nut-free, dairy-free, egg-free, vegetarian, vegan, and refined sugar-free lifestyles, this bark is the perfect treat! 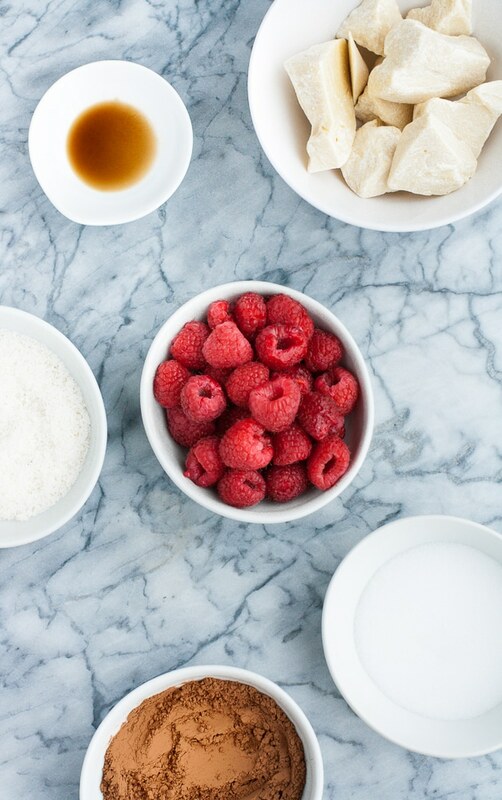 I love that this fun chocolate raspberry fat bomb recipe can be enjoyed by so many! Everyone will LOVE it, including YOU! Be prepared to recite this recipe a few times, because everyone is going to NEED to know how to bring this bark to life in their own kitchen! This delicious bark is super easy to make and requires minimal ingredients. I can’t wait to hear what you think! This recipe is absolutely decadent! Some of the ingredients included in this dessert are coconut oil, shredded coconut, cocoa powder, and vanilla extract! In addition to being super tasty, I love using these ingredients because they offer some pretty awesome health benefits. 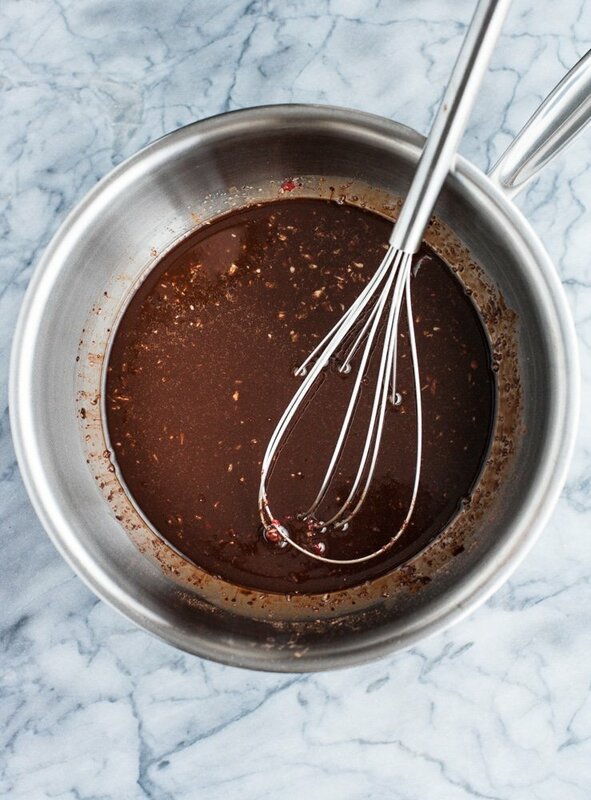 Did you know that vanilla extract has a bunch of benefits? It is a bit surprising, but extract actually helps with everything from anxiety and acne to digestion and heart health! Cocoa powder is another ingredient that has a surprising amount of benefits. Cocoa powder increases the amount of nitric oxide in the blood, a chemical that works to improve blood flow. This means that the chocolatey substance can be great for improving heart health and lowering the risk of stroke! In addition, that increased blood flow can help the brain operate more efficiently! Cocoa is good for more than just flavor, huh?! As always, this yummy, chocolate recipe complies with a ketogenic diet! Following a keto diet can make enjoying our favorite treats a bit tricky, but as you learn more tips and tricks, it becomes so much easier! 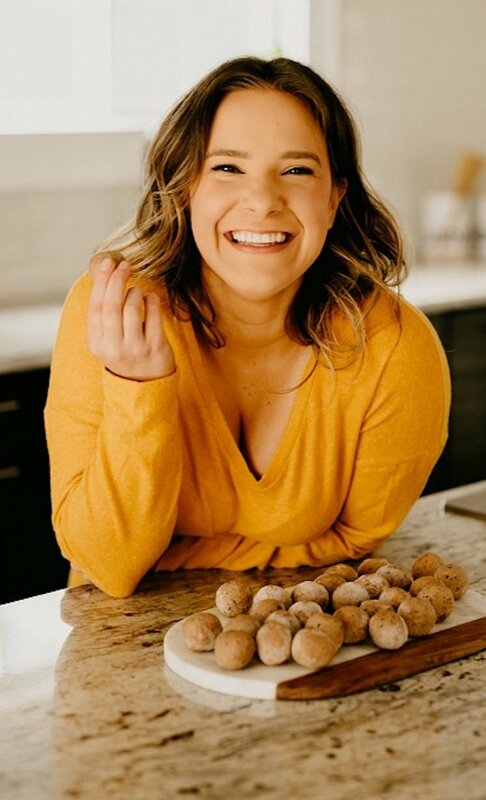 Over time, I have learned how to develop certain recipes in order to fully adhere to the keto diet. I learned about new and exciting ingredients and substitutions that contain fewer carbs with just as much flavor! 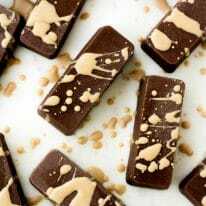 In order to keep this particular dark chocolate recipe as low carb as possible, I used a special ingredient that has been an absolute lifesaver in my recipe-creatin’ world. I don’t know how else to say it: monk fruit sweetener is AMAZING. Not only is this stuff super tasty (you cannot tell the difference between it and refined sugar), it also contains ZERO net carbs and ZERO calories! It is non-glycemic, so it will not spike your blood sugar or leave you feeling gnarly from a post-sugar crash. 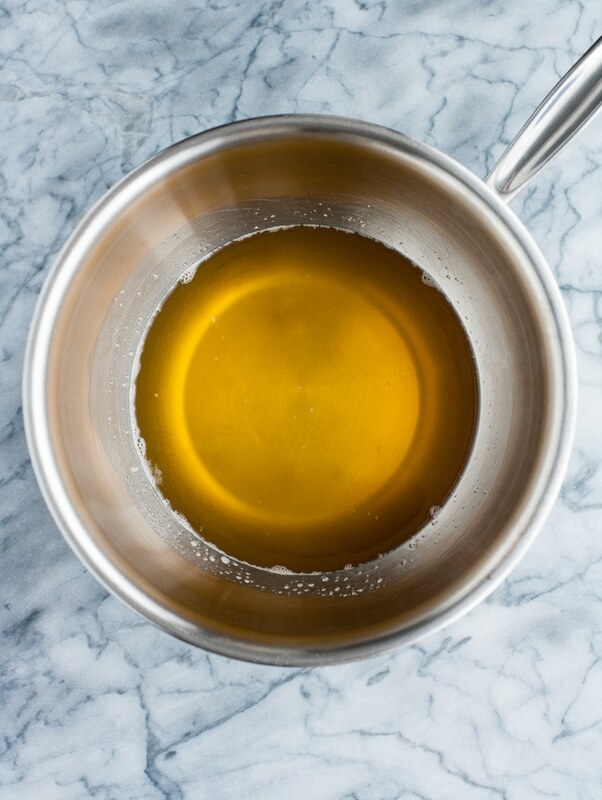 This sweetener is incredibly easy to use, as it incorporates into recipes at a 1:1 ratio. Right from the start, it is the perfect substitute. Since no measurements are required, the switch is simple. If you see a recipe that calls for a cup of sugar, swap it out for a cup of Monk Fruit sweetener instead! Lakanto makes two types of sweetener: Classic and Golden. Classic is typically used as a substitute for white sugar and Golden for brown, BUT you can totally use them interchangeably! If you are making something that calls for brown sugar but you only have the Classic version on hand, it’ll work perfectly. 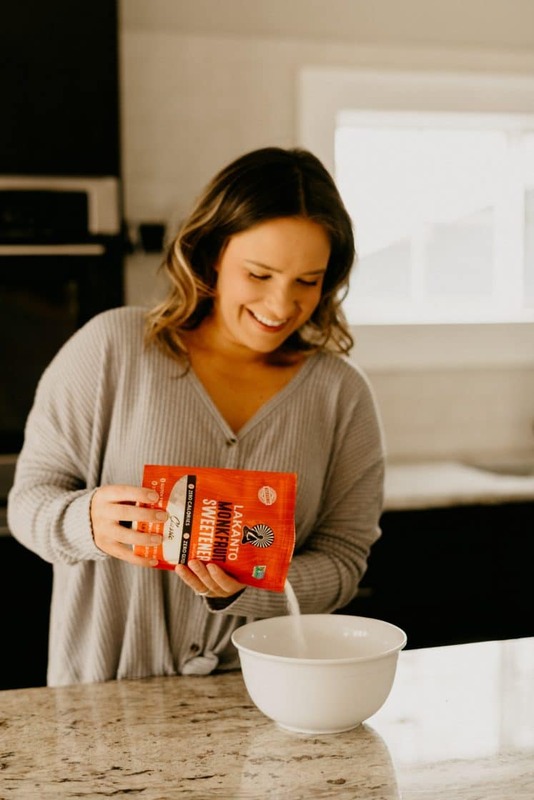 Lucky for Real Balanced readers, if you are interested in trying out monk fruit sweetener OR you need to restock your pantry, Lakanto has been super sweet (punny! Get it?!) and provides TWO ways for you to save! Use code “REALBALANCED” for 20% off on your order! Save 60% with the Lakanto Taste Test Bundle! To ensure that the fat from the cocoa butter doesn’t separate when chilling, it’s important to allow the bark to sit at room temperature after the chocolate has melted and has been poured onto a baking sheet. To make this recipe, you hardly need to do any work at all! After a quick cooking of the raspberries and melting of the cocoa butter, you’ll be well on your way to a finished product! Once the bark has hardened and is ready to enjoy, the recipe will yield approximately 18 1”-pieces chocolate bark servings. It is perfect to share (or enjoy all by yourself)! 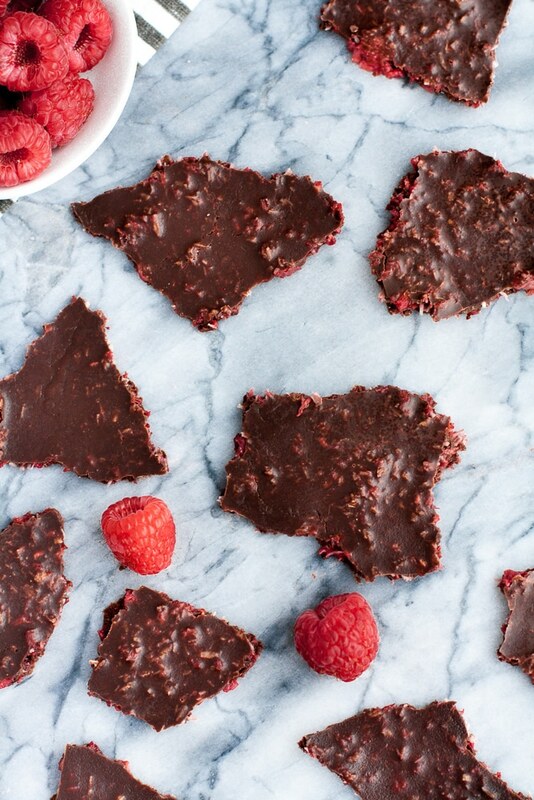 This raspberry chocolate bark is SO easy to make! Measure and prepare your ingredients. In a saucepan over medium heat, heat raspberries until the liquid has evaporated. Mash the raspberries using the back of a fork as they cook. Meanwhile, to a small glass or stainless steel bowl, add cocoa butter. Using double boiler method in separate saucepan on stove top over medium-high heat, heat cocoa butter until melted. 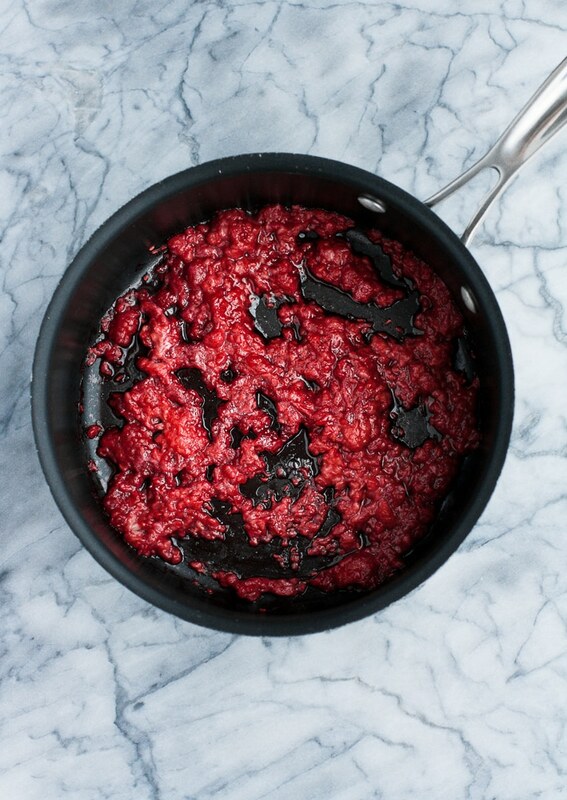 Remove pan from heat and add mashed raspberries, cocoa powder, shredded coconut, monk fruit sweetener, and vanilla extract. Thoroughly mix the ingredients together. Line baking sheet with parchment paper, allowing paper to overhang all edges of baking sheet. Transfer baking sheet to refrigerator to chill for 2 hours. Remove baking sheet from refrigerator and break chocolate bark into desired size. Share with family and friends OR enjoy by yourself! Complies with more than TEN diets and lifestyles! 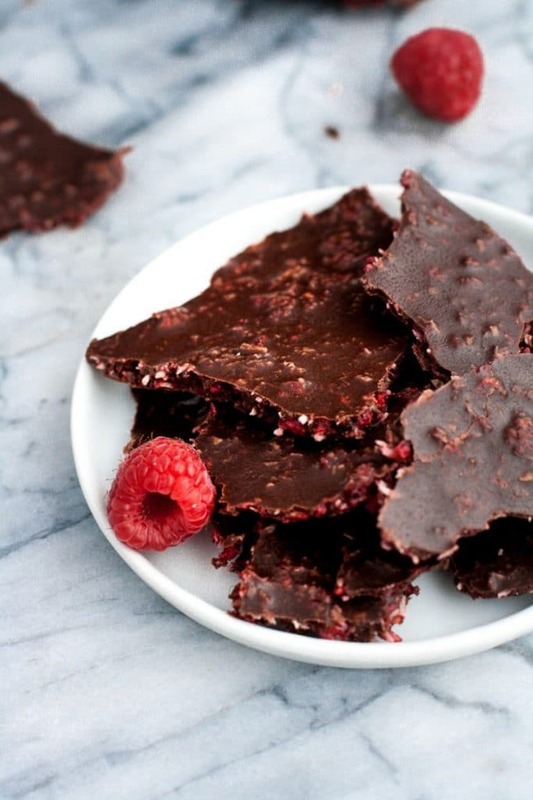 Keto and Low Carb: This delicious raspberry bark recipe only contains 1.6 grams of net carbs per serving. It is totally low carb and PERFECT for the ketogenic diet. 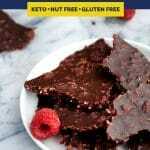 Paleo: This bark follows paleo diet restrictions and does not contain dairy, refined oils, gluten, soy, etc. Primal: This recipe completely adheres to primal diet restrictions. Gluten Free: Wheat, barley, rye, and other gluten-containing foods are absent from this recipe, making it great for those with Celiac or other gluten intolerances. Grain Free: Grains are not included in this recipe. 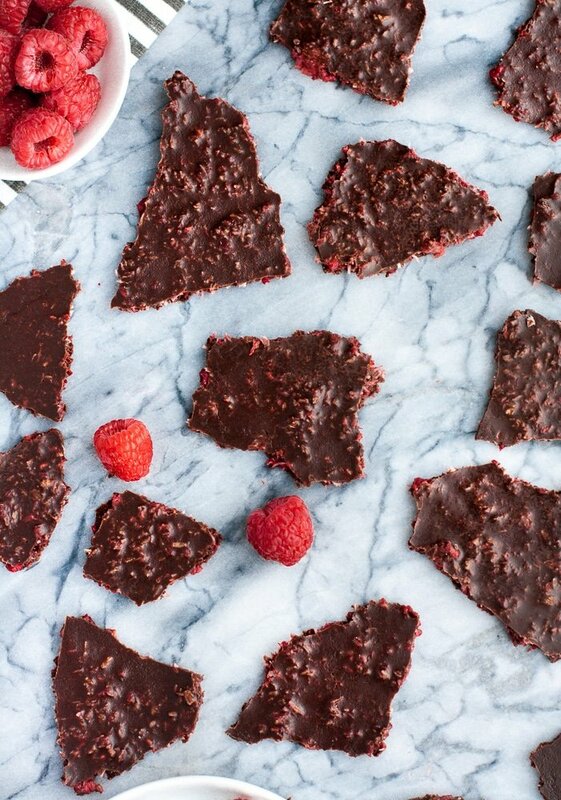 Nut Free: This dark chocolate raspberry bark is free of peanuts and tree nuts, making it perfect for those with nut allergies and intolerances. Dairy Free: Dairy products are not used in this recipe. Egg Free: This bark does NOT require the use of eggs. Vegetarian: Free of meat, this recipe is vegetarian-friendly. Vegan: This recipe does not require ANY animal products, making it totally perfect for those that follow a vegan lifestyle. Refined Sugar Free: This recipe does not call for refined sugar. Need more recipes to satisfy that sweet tooth? If you are in need of some additional Real Balanced dessert ideas, do not worry. I LOVE creating treats, so rest assured that there are PLENTY more where this bark came from. Check out some of these yummy ideas! 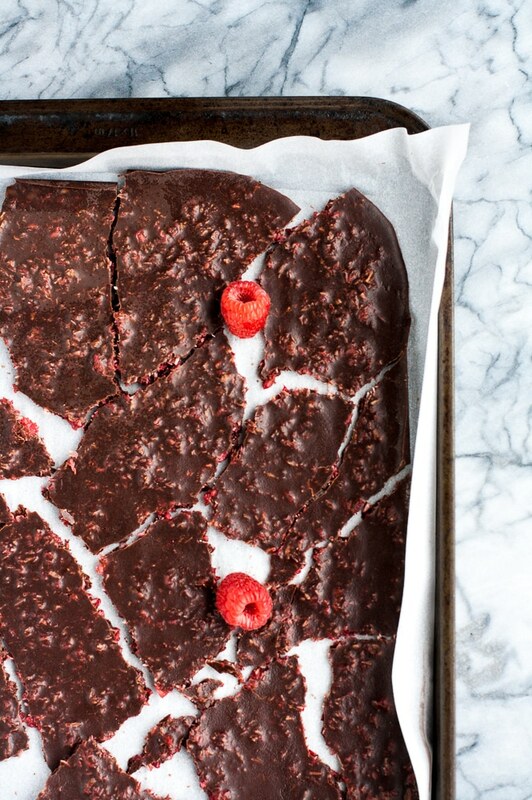 This delicious and decadent Dark Chocolate Raspberry Bark is a perfect keto, paleo, and vegan dessert recipe to whip up and enjoy! 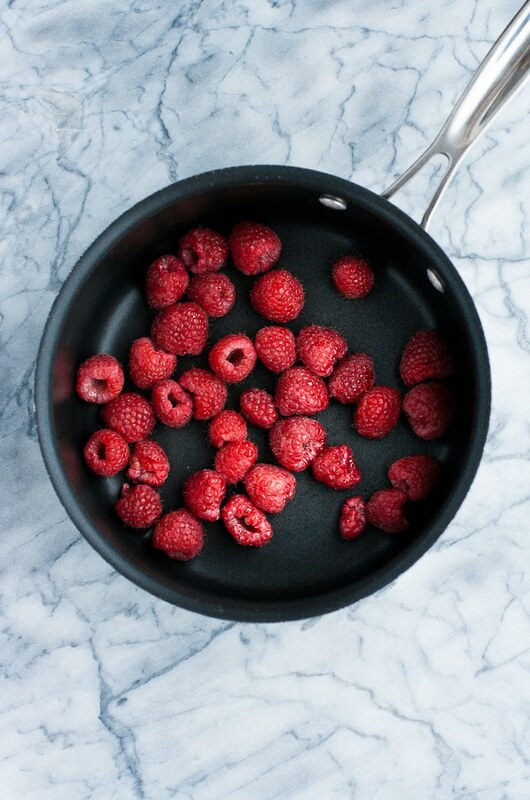 In a saucepan over medium heat, heat raspberries until the liquid has evaporated, about 8-10 minutes, mashing the raspberries using the back of a fork as they cook. 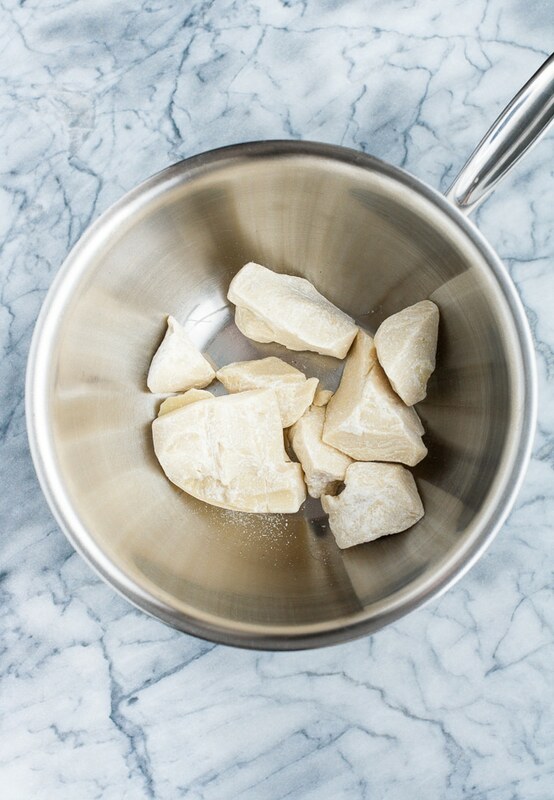 Meanwhile, to a small glass or stainless steel bowl, add cocoa butter. Using double boiler method in separate saucepan on stovetop over medium-high heat, heat cocoa butter until melted, about 8 minutes. 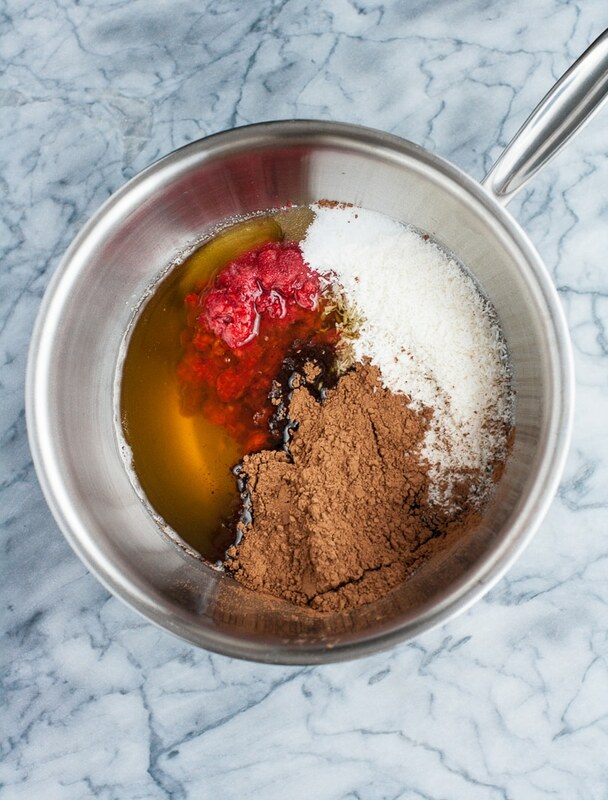 Remove pan from heat and whisk in mashed raspberries, cocoa powder, shredded coconut, monk fruit sweetener, and vanilla extract. Line baking sheet with parchment paper, allowing paper to overhang all edges of baking sheet. Pour melted chocolate mixture atop parchment paper. Allow melted chocolate to sit on baking sheet at room temperature for 1 hour before transferring baking sheet to refrigerator to chill for 2 hours. Cocoa Butter: Cocoa butter is different than traditional butter and coconut oil. There is not a substitution for this ingredient and cocoa butter must be used in this recipe. 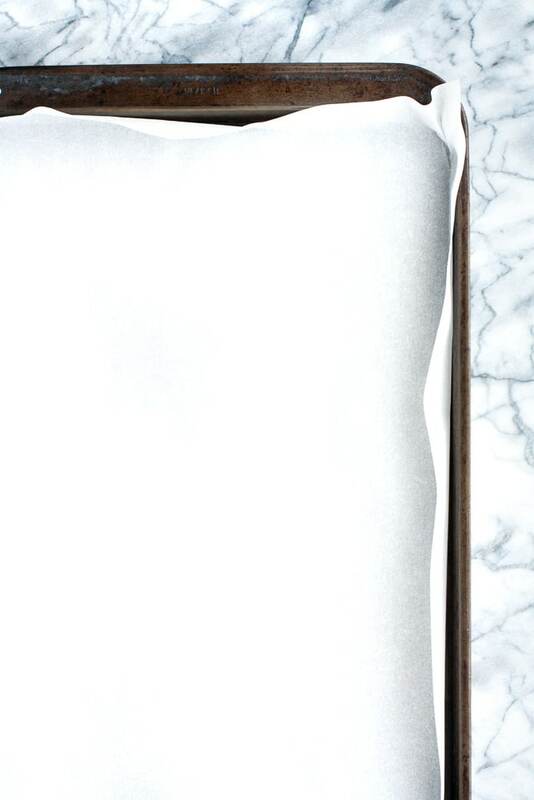 Fat Separating: To ensure that the fat from the cocoa butter doesn’t separate when chilling, it’s important to allow the bark to sit at room temperature after the chocolate has melted and has been poured onto a baking sheet. Is there a substitute for cacao butter? Unfortunately, no, it’s required to make the chocolate here. What is equivalent for 200g? Equivalent to what? 200g is ~7 oz. Since cocoa butter comes in pieces, and every piece is a different size, it’s challenging to say whether it’s a cup, 2 cups, etc., so I use weight measurements so the recipe and nutrition info is exact. I’d suggest getting a food scale, which will ensure you always create recipes exactly as written (weights are much more exact than a tablespoon or cup measurement for many ingredients). I am looking for a recipe for chockolate when I will not taste powdered sugar in it? I tried a few times and it did not work. I used same monk fruit sweetener and made it into powder using my coffee grinder. I would like to try this recipe but what is the tip to not taste powdered sugar in it? Am I doing something wrong or all homemade chocolates have this taste and it is not a problem for chocolate eaters? 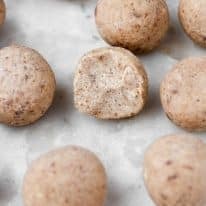 If you mean that you don’t like the taste of sweetened chocolate at all, you could altogether omit the sweetener, but the result will be very, very bitter chocolate. If you are referring to the texture, monk fruit sweetener doesn’t dissolve like traditional sugar. If you didn’t like the texture, even after powdering the monk fruit sweetener, you could try powdered or liquid stevia!